227 to 221 million years ago, the Carnian is dominated by big dicynodonts, medium size rhynchosaurs and medium traversodonts. Kanneymeriid dicynodonts, are the big herbivores by the Late Carnian and they are still common. They are reduced in diversity, with only one species found in each local fauna. The most common is the tusked Placerias. Rhynchosaurs looked like big buck toothed lizards designed to gnaw tough vegetation. Hyperodepedon was an advanced form. They were an important group of herbivores but died out during the Late Triassic mass extinction. Traversodontid cynodonts were medium size plant eaters derived from the carnivorous cynodonts. Aetoesaurs are medium size herbivores important in some locations a preview of the armored dinosaurs to come. Temnospondyl amphibians are wide spread. Phytosaurs, rauisuchids, postosuchids ornithosuchids, and early theropod dinosaurs are the top carnivores. In the Late Triassic Carnian and Early Jurassic cycadoids or bennettities are the characteristic plants and other conifers are wide spread. Cycadoids are generally medium to low in height they are thought to be slow growing with foliage high in toxins and generally of low food value. Superficially cycadoids resemble cycads which become more common later in the Jurassic declining in the Cretaceous but still surviving today. Some are slender with branching trunks like modern palm trees to which they are not closely related. Others look like pinecones or pineapples with leaves on top. Older Paleozoic flora like the giant club Moss and horsetails still are present in wet areas but they steadily decline and primitive conifers and ferns are wide spread. Rhynchosaurs had beak-like mouths that they would have used to lop the tough plants of the Triassic, probably seed ferns. There at least two pulses of dinosaurs at the end of the Triassic. Staurikosaurus (Southern Cross reptile) was small and agile dinosaur with a slim body, a long, slender tail, sprinter's legs, and shins longer than its thighs. Its head was large for its size, with sharp flesh-eater's teeth. It probably had short arms with 5 fingered hands, and also 5 toes and is related to the larger Herrerasaurus. Before the finding and the Madagascar prosauropods, Eoraptor, a small theropod was considered the most primitive dinosaur known. Staurikosaurus and a rhychosaur. 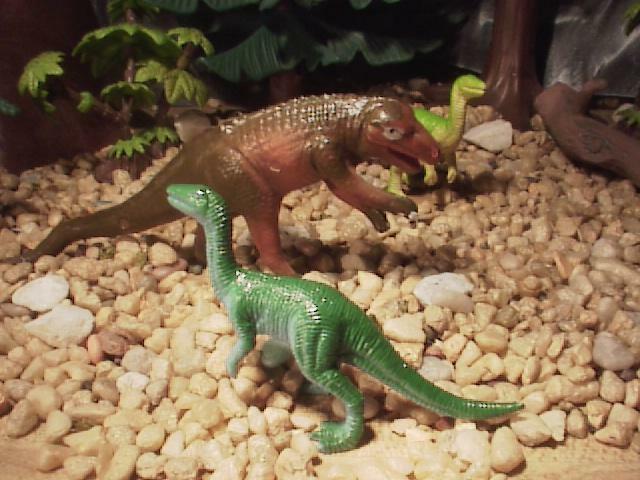 Since neither of these animals is produced as a toy figure I used an anonymous dinosaur from the Rendition Cave woman figure for Staurikosaurus. 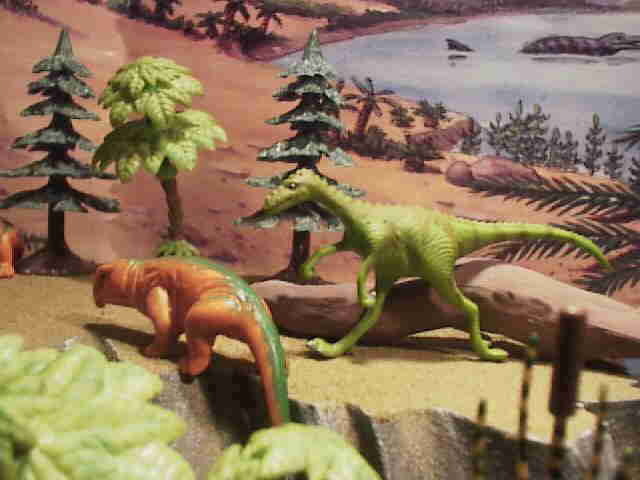 To be a Staurikosaurus it should have a five-toed foot instead of the normal theropod three-toed foot. The Captorhinus (an Early Permian reptile) from a party favor set made in china most resembles the buck toothed rhychosaur Scaphonyx. The traversadont Exaeretodon one of the most common animals of the Carnian age being wide spread in Gondwana a herbivorous traversodont reaching 5 feet in length..
Dino Warrior Tyrgont. It is the closest match I found for a traversadont. The dicynodonts decline in diversity from the Middle Triassic. Still wide spread but there is only one variety of placerias in each formation. They are common and the largest herbivore. Hollow vinyl figures from China. Lakes and rivers are the home of amphibians and the newcomers the semi-aquatic phytosaurs. The most primitive members of the Family are represented by a number species of the genus variously known as Parasuchus and Paleorhinus. These were about 7 to 12 feet long which big enough to tackle just about anything in their environment, except a bigger phytosaur! Amphibians include the familiar mastodonsaurids from the Middle Triassic and the new big metoposaurs and small latiscopids. They spent much of their time submerged in ponds, rivers, and swamps. Saurosuchus was the last of a lineage, of large carnivorous pseudosuchians the Prestosuchidae. They are holdovers from the Middle Triassic. They co-exist quite happily alongside other related but more advanced carnivores, such as rauisuchids, postosuchids ornithosuchids, and early theropod dinosaurs, it seems that these various top predators specialized in different ecological niches. Saurosuchus was without doubt top predator of its environment feeding upon the large kannemeyerid dicynodonts and the medium-sized rhynchosaurs and traversodontids. This a Schleich gavial customized into a phytosaur by moving the nostrils just before the eyes. The Mastodontosaurus is by Bullyland from Stuttgart Museum series discontinued in 2004. This choice may seem unusual to North Americans but the animal is relatively well known in Europe where it was discovered early. I used a Lido copy and a party favor figure to represent the armored aetosaur's that where the common plant eaters. Last is a large headed thecodont similar to Saurosuchus. Ornithosuchus longidens was a large active terrestrial carnivore, 9 to 12 feet long found in Scotland. Early books illustrate Ornithosuchus as a theropod-like biped, with long strong legs and diminutive fore-arms. It was an early candidate for a dinosaur ancestor but now is more closely to crocodilians. Ornithosuchus probably some degree of bipedalism. They could indeed move on their hind legs but were just as comfortable on all fours. It is own to bkn more closely related to crocodilians than dinosaurs. Ornithosuchus was around 4 metres (13 ft) in length it belongs to the same family as Venaticosuchus and Riojasuchus. There are five toes on each foot and a double row of armoured plates along the animal's back. Starlux Ornithosuchus and Dollar Store podokosaur. The Stagonolepis, were an important medium size plant eaters that first appear in the Middle or Late Carnian. They we presumably descended from carnivores. The narrow pig like snouts could be used to grub up roots and insects. The QRF Stagonolepis. 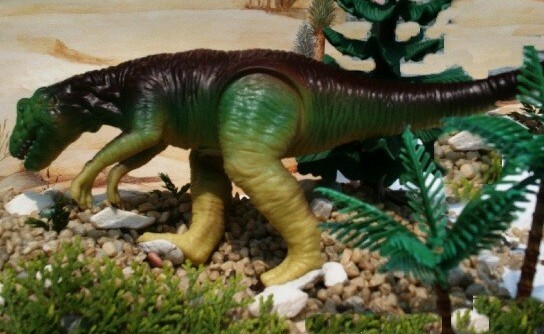 The Ral Partha figure painted as WWD Postosuchus. Late Triassic Carnian of Ischigualasto Argentina in has produced some of the first dinosaurs, only finds in Madagascar being older. The earliest known dinosaur fauna have a small dinosaur component estimated at about 2% of total finds. Herrerasaurids are the most common super predators. Dinosaurs were not an immediate success when they first appear. Rhyncosaurs and cynodonts are far more common than dinosaurs and in fact the rhyncosaur Scaphonix accounts for half of all tetrapod fossils The older ornithosuchids and rauisuchids survive until the end of the Triassic. The herbivore roles are filled by rhychosaurs, aetosaurs and the remaining dicynodonts. Herrerasaurus may have lived in upland forest areas with seasonal climate, preying on the early plant eating dinosaur Pisanosaurus and rhychosaurs. Herrerasaurus is a very odd theropod and at one time was consider to be too primitive to be classified in the same family with later carnivores. Now is is thought to an early side branch of the theropod family that died out. Dinosaurs are neither the most numerous, nor the largest animals from Ischigualasto. A top predator Herresaurus was the first big theropod at 10 feet. Dinosaurs at this time only make up only about 6% of all tetrapod's and have few species. They diversify in the following Norian after an extinction that clears out the top predators. Procon Herrerasaurus and Postosuchus distributed by Lontic. This not a very good reproduction from the Dinosaur Series of Toys from China. It is supposed to light up and make sounds. The only point of interest is that was labeled Herrerasaurus. Site A icon to the right for Dioramas organized by period or by manufacturer.